The Adva Center is a policy analysis institute seeking to advance equality and social justice in Israel through influencing public discourse and policy formation. The center was established in 1991 by activists from three social movements: the feminist movement, a movement to advance equality of Mizrahi Jews and a movement to advance equality of Israeli Palestinians. Adva’s studies of Israeli society present critical analyses of public policy in the areas of budgets, taxation and social services, education, health, housing, social security and welfare, and transportation. In general, Adva criticizes the neoliberal policies practiced by Israel since the mid-1980s, most prominently privatization and the state’s abdication of responsibility for providing social services. 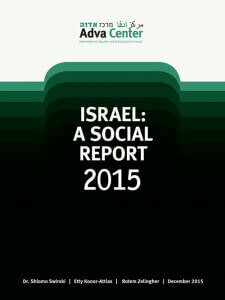 The studies examine the implications of these policies for Israeli society and formulate recommendations for policies that will decrease socioeconomic gaps and ensure appropriate social services for all. Adva’s publications include yearly overviews of socioeconomic trends in Israel and in the labor market, commentary on the state’s budget proposals, gender analyses of state and local policies, budgets, and practices, reports on the socioeconomic implications of Israel’s occupation of Palestinian territories, reports focusing on specific social services like education or health, and more. One good example of the relevance of Adva’s reports concerns various proposals to postpone women’s entitlement age for old-age and workplace pensions. 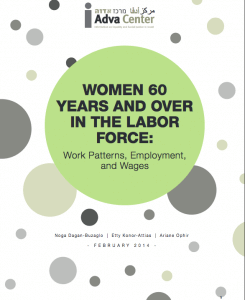 Adva’s report on women over 60 in the labor force (funded by the Rosa Luxemburg Stiftung) shows that such a measure will leave many women over 60 without an adequate income. The Adva Center has become a popular address for researchers, policy makers, activists and journalists. Adva disseminates its knowledge and insights through lectures and workshops, and joins with other organizations in public and advocacy campaigns. One major topic in which Adva contributed to a significant change in the public discourse is that of the state budget, previously reserved for experts alone. Adva’s long-term and multi-dimensional work on this topic has helped to make the state budget more transparent and publicly understandable and has highlighted the social significance of budgetary decisions. One of the main foci of Adva’s work during recent years has been gender equality. In different frameworks and with various partners, Adva has taken a leading role in working to mainstream a gender perspective into national and municipal budgets as well as into public policy, to eliminate gendered salary gaps, and to empower women to take an active role in the struggle for gender equality. Adva’s work for gender equality includes publications, workshops, community action work, advocacy and more. One of the achievements of this work is the inclusion of “gender analysis” chapters in the official 2015-2016 budget proposal. Adva and RLS have been working together since 2009. With RLS support, Adva has published two series of reports. 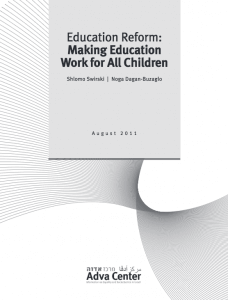 One deals with the Israeli education system, highlighting trends of segregation, tracking and privatization, critically examining their contribution to the growing inequality in pupils’ performance, and recommending measures to increase equality with regard to the level of education offered to all pupils and in pupils’ achievements. The second series highlights blind spots in our perception of the Israeli labor market regarding the middle class, women over 60 in the labor force and self-employed persons. Our cooperation continues. 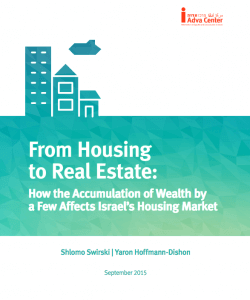 During 2015-2017, Adva is compiling reports tackling the un-affordability of housing in Israel by examining major players in the housing market. Initial findings were published in August 2015, showing that while many Israelis struggle with increasing housing costs, the state is less willing to invest in providing decent housing for all, significantly shrinking the budget of the Ministry of Housing, at the same time as the state’s income from different real-estate taxes increased. The first full report, “From Housing to Real Estate – The Implications of the Accumulation of Wealth in the Hands of Few on the Housing Market,” was published in September 2015 and received considerable media attention.